While staying at the Inn, you are invited to visit the Birds of Paradise Gardens. Birds of Paradise Gardens is located a half mile west of the Inn. The Gardens is a new project and will be an ever-evolving adventure as we work to restore grassland pasture, salt flats and native vegetation for birds and other wildlife. 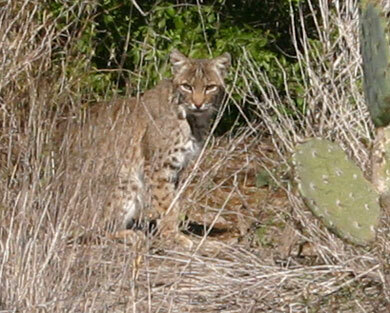 If you are lucky, in the late afternoon you might catch a glimpse of a resident wild bobcat. Bobcats are elusive so you have to keep your eyes open. Mesquite trees provide much needed shade from the hot summer sun. Guests arrive back at the pier after a fun filled day of fishing. A new fishing pier, with cleaning station and two lights for night fishing, has generous areas for guests and fishing gear. With a knee high rail, it is perfect for sitting and with holes in the rail, for holding your fishing poles. Recently added is a boat landing platform; making easier to get into and out of boats. Roseatte spoonbills and a longhorn, on property adjacent to the Gardens, enjoy a seasonal water pond. All Inn Visitors: Birds of Paradise Inn provides an intimate surrounding with restful accommodations similar to those offered by Boutique Hotels. Make your visit to the Costal Bend of Texas and Baffin Bay special. 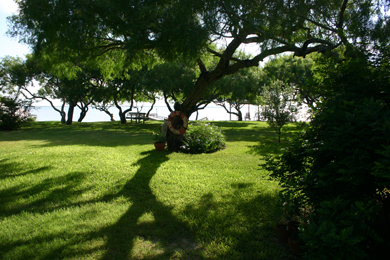 Enjoy the Inn's two beautifully landscaped acres and 150 feet of bay front property. The Suites offers free wireless Internet connections and high definition TVs. The Inn has picnic tables, BBQ grills and a lighted fishing pier with cleaning station for registered guests. For Birders: Birds of Paradise Inn & Gardens is located on the Great Texas Coastal Birding Trail's, Central Texas Coast, Kingsville Loop. We are across the street from the mud flats of the Kaufer-Hubert Memorial Park. 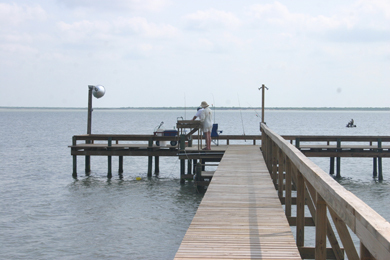 Also close are the Riviera Fishing Pier and other sites on the Kingsville Loop. We have guide books and reference guides which we are happy to share with you. We can also help recommend guides, such as those on the King Ranch, for personalized tours of great birding sites. The Inn offers a centralized location for day trips to other areas of Texas. Travel north to see the whooping cranes that winter in Port Aransas or south to visit the World Birding Centers of South Texas. For Photographers: The Central Texas Gulf Coast is a wonderful opportunity for photographers offering unusual wildlife, insects, plants and birds as possible subjects; many of which can only be found in south Texas and into Mexico. Sunrise and sunset are perfect times to go out and photograph your subject with the morning or afternoon sky providing a spectacular and colorful backdrop for your images. Ask us about a visit to Birds of Paradise Gardens. 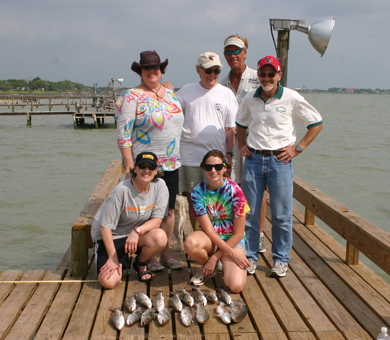 For the Fishermen and/or Hunters: The Baffin Bay area is well known for its outdoor activities. We invite you to bring your own boat as we have boat parking available. If you do not have a boat or do not want to bring one, we can suggest fishing guides. We can also help with hunting guides. 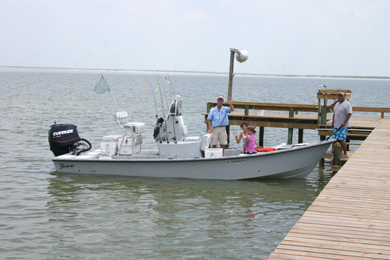 If fishing, let your guide know they can pick you up at the Inn since we are close to the only public boat ramp on the bay or at the pier we have a boat landing specifically designed for guests and fishing boats. For Nature Lovers: The Birds of Paradise Gardens, about a half mile from the Inn, is unique as it contains several micro-environments which are representative of the Costal Bend and South Texas areas. The Gardens is only in its infancy, but visitors to the Inn are invited to The Gardens for photography, hiking and bird watching. For years, the Gardens was home to cattle ranching, but their presence caused a lot of damage to the pastures, salt flats, and brush lands. Now zoned a Wildlife Habitat, the Gardens is a restoration project in the works which will provide habitat for resident and migratory birds and other suitable wildlife. The Gardens will eventually have nature trails and viewing/photography blinds for visitors. For Families: The Inn is a great location to reconnect with your family. Teach your kids how to fish. Search for shells along the beach. Have a picnic. Take a nature hike. In the evening, sit together on the porch and tell ghost stories or play a game of cards. Reconnect and have fun together. The Inn is also perfect for family reunions. The suites offer privacy, but connecting doors between the suites can be opened so families can have easy access to one another. For Group Gatherings: The Inn has a Pavilion which can be used for family or group gatherings. Also available are picnic tables and BBQs. We can recommend guides to take your group on a day of adventure birding, fishing, boating, or hunting. A 50% Reservation Deposit is required at the time the reservation is made with the Balance Due at arrival and check-in. For the deposit, we accept VISA, Discover, MasterCard, and American Express. Cash, checks and travelers' checks are also accepted. Deposits are required to secure your reservation dates. We accept VISA, Discover, MasterCard, American Express, Cash and travelers' checks for payment of the balance due for your stay. If you arrive after 6:00 PM, your credit card may be charged for the balance. If you would like us to use a different credit card, please let us know. Please note we are not able to accept checks on the day of arrival for the balance due. If you find it necessary to cancel or change your reservation, we will do our best to re-book the Suite or House. For a full refund, reservations of a suite must be canceled or changes made more than 7 days prior to your date of arrival. Within 7 days, there will be no refunds, unless we are able to re-book, you will receive a refund, minus a $25.00 service charge. For the Blue Heron House or multiple accomodation reservations, reservations canceled more than 14 days before your date of arrival, there will be a full refund. Within 14 days, there will be no refunds, unless we are able to re-book, minus a $40.00 per accommodation, service charge. Please contact us for groups, family reunions and special events; we will make your stay with us special and an event to remember. A 50% Reservation Deposit is required at the time the reservation is made with the Balance Due at arrival and check-in. Deposits are required to hold your reservation. Rental of the Blue Heron House and Suites have a minimum two night stay. Check-in is between 4 PM and 6 PM. Please call or let us know if you will be checking in after 6 PM so that we may accommodate your arrival and get a key to you. If you would like to arrive prior to 4 PM, please call several days in advance to see if we can accomodate the request. Please note, there may be an additional $40 charge for an early check-in. Check-out time is 11 AM as we need time to properly prepare the House and Suites for arriving guests. Please check with us in advance if you would like a late check-out; late check-outs are $40. Birds of Paradise Inn is a non-smoking property. Cigarettes, cigars, and candles are not allowed in the house or suites. Smoking is permitted only in the picnic areas, gardens, and by the fire/barbeque pits. Sand buckets have been placed around the property for your convenience. Smoking in the suites or house may result in an additional $200 cleaning fee. We love well mannered children of all ages. Please bring a crib if you are bringing an infant. Children 12 and under must be accompanied by an adult at all time on the grounds and on the fishing pier. Children should have flotation devices if on the pier or near the water. We also love well-mannered pets, but please call and discuss your pet and their needs before you bring them. We understand the trauma traveling sometimes has on pets, so if we agree that your pet will visit the Inn, please note that no pets may be left unattended in the House, Suites or grounds. Pets must be crated if left unattended and when crated it must be only for a short period of time. Please bring leashes, food and water dishes, towels, furniture coverings, toys and food for your pet. Inn dishes are for human use only. If you forget to bring something, please let us know. In order to protect the Inn, property and our other guests, guests agree to assume all financial and legal responsibility for their pet; we suggest checking your homeowner’s policy for pet coverage. Please read our Pet Policy. Please note, for pets that arrive, are not pre-registered and/or do not follow Inn Policy, guests may be asked to leave without a refund and reservations canceled. We want to insure everyone staying at the Inn, including pets, have an enjoyable time. Occupancy and use of Birds of Paradise Inn Beach Guest House, Suites, Gardens, pier, etc. is limited only to registered guests. The fishing pier, picnic areas, etc. are only available to registered guests. Please no tents, temporary shelters, wading pools, or the use of recreational vehicles (RV parking is available while you stay at the Inn). Parking is allowed only in designated parking areas, not on the grass or in the drive. Guests are responsible for payment of all damages to the Inn and/or Inn property and your credit/debit card may be charged for any and all amounts incurred during your stay including the balance owed and/or damages. Licenses for hunting and fishing, as required by the State of Texas, are the responsibility of the hunters and fishermen. Please contact the Texas Parks and Wildlife Department for information or visit their web site http://www.tpwd.state.tx.us. The Kleberg County Game Wardens are very active, so please make sure your licenses are current. When you are fishing keep your license and a photo ID with you. There are fish cleaning stations at the end of the Inn's pier and also at the county park's public boat ramps. Please, no cleaning of fish in the suites, in the house or on the grounds of the Inn. This part of Texas is a desert and can be dangerous. If it has thorns, bites or stings, you might find it here. We ask you, your family members, and all visitors to be careful as you enjoy the area but please note that Birds of Paradise Inn & Gardens assumes no responsibility for personal injuries which might occur and/or personal property losses. Security cameras and alarms are installed to protect the Inn and property. Please note that breach of Inn policies may result in additional charges to replace and/or repair any lost or damaged Inn property and/or you and your guests may be asked to leave without a refund for unused nights. In order to protect the safety of our guests and property, Birds of Paradise Inn reserves the right to enter a suite and/or the guest house at any time.